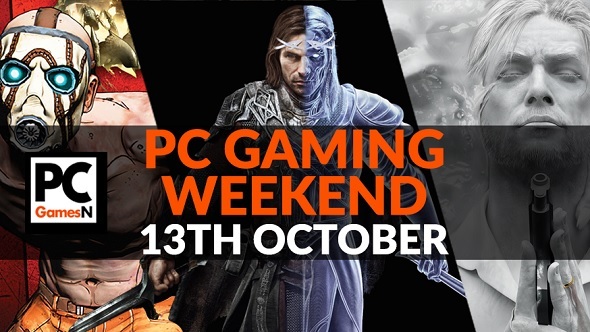 Your PC gaming weekend: play The Evil Within 2, mod Total War: Warhammer 2, get Borderlands cheap, and more! Enter our big Star Trek Online giveaway – you can win up to two new ships! To celebrate the arrival of Star Trek Online – Season 14 we’re having a giveaway. Ther are two tiers of prizes, but both of them give the winners a new starship that they can take back into the game with them. Do you like to roam the wastelands and shoot everything that moves? The Borderlands series will be right up your street if you answered positively to that question. If you haven’t played them yet, or maybe just one or two of them, now’s your chance to pick up the lot for the price of a couple of pints at your local. Middle-earth: Shadow of War has been out since Tuesday but perhaps you haven’t had time to get into it yet – you probably haven’t beaten the campaign and the endgame at least. Well, here we are, the weekend. It’s time to sink some proper hours into it. If you’re one of the people who used to believe that World of Warplanes had problems – ones big enough to stop you playing it – then listen up. This past week saw a huge 2.0 update land for the game and with a new Conquest mode. It fixes many of the issues people had with the game before. Time to find your wings again? BOOM! Junkrat is now available to play in the Heroes of the Storm PTR. He’s there with his Frag Launcher throwing up grenades in every direction you could wish for. We’ve got a list of all of his talents linked above if you want to find out what he’s all about. The answer is explosions. Obviously. If you’re a fan of The Witcher games then you will know that you can never have enough of it. Here, then, is a right treat just for you. A documentary split into several parts that sees developers CD Projekt Red recounting a lot of the effort that went behind making their trilogy of games – with many insights you would have never heard before. It’s here at long last, but… are you ready to play through The Evil Within 2? That’s what we’ve been doing and have discovered that, yep, it’s absolutely terrifying. It manages to mix up its pacing and gruesomeness to keep every single hour fresh in the most horrifying way. Given the popularity it has sustained over the years many of us believe World of Warcraft is invulnerable. While it isn’t suddenly going to lose millions of players, it turns out that it can be damaged in another way – by a speedrunner. Watch the video in the link to see the game turned inside out. As developers Creative Assembly promised, Steam Workshop for Total War: Warhammer II is now here, just a couple of weeks after it launched. That means, yes, you can now start looking for mods to make the strategy game better, stranger, prettier – all of the above? Yes, Rocket League has already had one batch of The Fast and the Furious DLC but now there’s more! This second lot includes a couple of classy cars for just a couple of dollars. They’re purely cosmetic, as you’d hope, so don’t start pulling an angry face.